What most of us think of as Shepherd’s Pie is actually Cottage Pie. 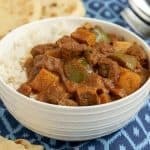 This easy recipe is very adaptable and perfect for a comforting dinner. 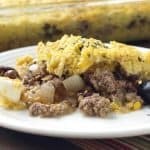 What do you call a comforting dinner made up of a layer of ground beef (sometimes with vegetables) covered with a “crust” layer of mashed potatoes? For many in the States it’s known as “shepherd’s pie,” but, if you trace this dish back to its origins, it actually should be called “cottage pie”. It’s no wonder these two, very similar, dishes are often confused. Both consist of a meat base covered in a potato top crust. The only real difference between the two is the meat. 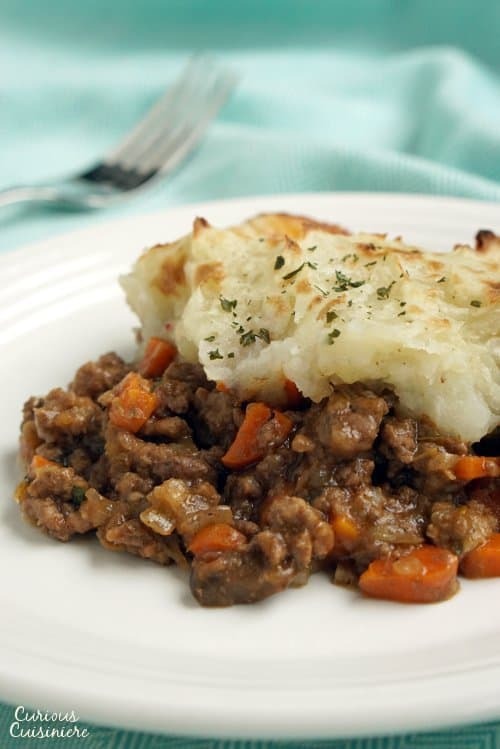 “Shepherd’s pie” is made from lamb (hence “shepherd”), while “cottage pie” is made with beef. Cottage pie is actually older than shepherd’s pie. 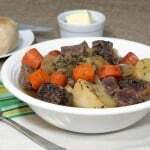 It is a dish that originated around the time that potatoes were introduced in the UK (in the late 1700s). Potatoes were affordable ingredients that were often used by the peasants, who lived in cottages. So, “cottage pie” was an easy to make, affordable dish invented to fill peasant tummies. 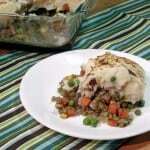 Is Shepherd’s Pie Irish or Scottish? 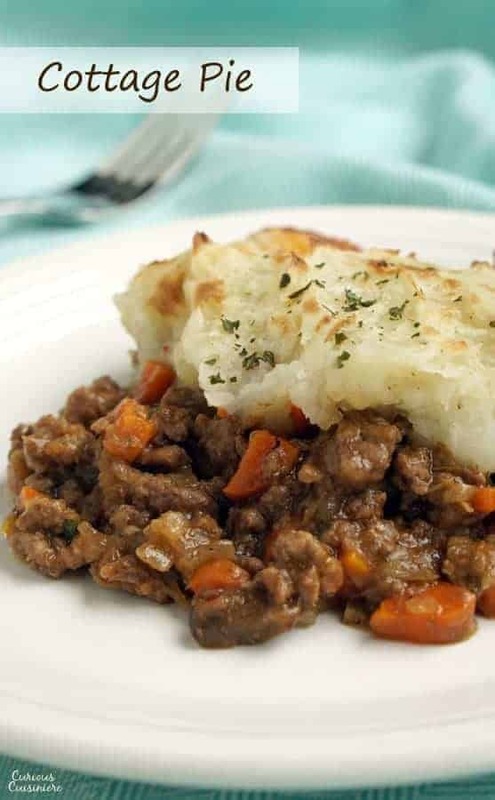 However, cottage pie probably originated in Scotland, in the North of the UK. Meat pies were common in this region, and were topped with pastry crust before the 1700s when potatoes were introduced as a crop. Once the potato crust came into play, cottage pie as we know it today came into being. 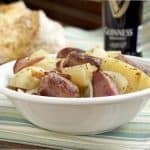 As cottage pie became popular throughout Britain and potatoes became a staple crop in Ireland, the dish began to be more associated with Ireland, and similar pies with a pastry crust began to re-emerge in Scottish cuisine. At its most basic, cottage pie is a meat pie (or casserole) that is topped with mashed potatoes rather than a pie crust. After this, it can vary greatly from region to region (or kitchen to kitchen). 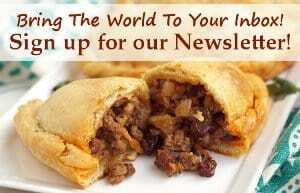 Sometimes you will see other vegetables like celery, mushrooms, or peas studded through the meat filling. Other times it is only onions and maybe smattering of carrots. Some add a wide array of herbs, others season it more simply. What’s really fun, is the variations on cottage pie that you see in British cuisine, and that have made their way to the States with the immigrants. 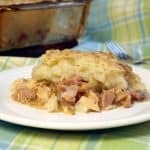 A version of cottage pie, called St. Stephen’s day pie, is made with leftover Christmas turkey and ham to celebrate St. Stephen’s feast day on December 26. Pate Chinois is a French Canadian version where you will find corn as the vegetable of choice in the meat filling. You’ll find another variation of cottage pie in the coastal regions of Britain. 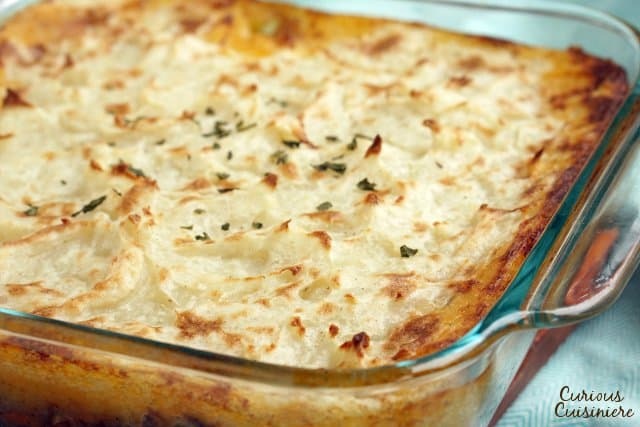 Since seafood is abundant, their cottage pie becomes a fish pie. And, if you top the potato crust of your traditional cottage pie with breadcrumbs and cheese, it becomes a Cumberland pie. Once you have the basic concept, cottage pie is a great way to clean out your fridge of bits of veggies and leftover mashed potatoes. 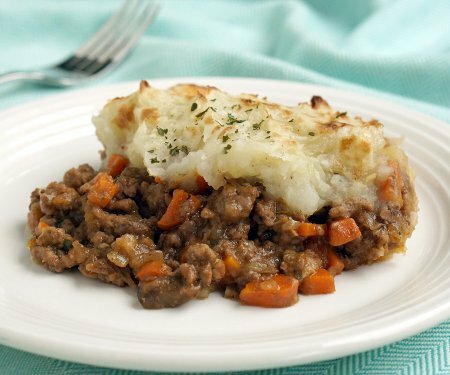 For our easy cottage pie recipe, we’re sticking with a simple filling and just adding carrots to the beef. What most of us think of as Shepherd's Pie is actually Cottage Pie. 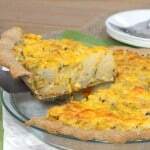 This easy recipe is very adaptable and perfect for a comforting dinner. Saute your beef over medium high heat until browned, 7-10 min. Remove the beef from the skillet. Add the vegetables** and garlic to the beef juices in the pan. Cook until soft, 7-10 min. Reduce the heat to medium and add the tomato paste and flour. Saute until the flour is completely moistened. Return the cooked beef to pan. Add the stock, Worcestershire sauce, and thyme. Simmer 5-10 min, until the gravy thickens. Taste the mixture and season with salt and pepper to taste. Transfer the meat mixture into a greased, 8x8 baking dish. Spoon or pipe the mashed potatoes over the meat mixture. Place the dish in the oven at 400F and cook for 20-30 min or until the top is golden and the filling is bubbly. Let stand 5-10 min before serving. *To Make Mashed potatoes. Boil 2 lbs of peeled potatoes until very tender. Drain and mash with 1 Tbsp butter and ¼ c milk using an electric hand mixer. Season with salt and pepper to taste. ** Feel free to add ½ lb diced mushrooms, a couple stalks of celery, or a cup of peas to the vegetable mixture being sauteed, as desired. NOTE: This dish can be frozen before baking. To cook, thaw overnight in the refrigerator and then cook as directed. Or, cook from frozen in a 350F oven, covered with foil for 1 ½ hours. Increase the heat to 400F and uncover for a final 20 minutes, until the potatoes are golden and the filling is bubbly. Actually, your comment that Cottage pie is really Shepherds pie is incorrect. 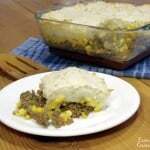 Cottage pie is made with beef and Shepherds pie is made with lamb. As a Brit living in the USA, I would know this. Besides, there would be no reason to call it two different things if the ingredients were the same. Hi Rosie, Thanks for your comment. What we state at the beginning is that what most people in the States know of as “shepherd’s pie” is really “cottage pie”. 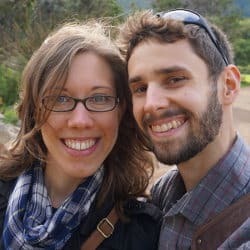 Since you’re living in the US, you’ll know that most people here don’t know what Cottage Pie is, but they do know what Shepherd’s Pie is. And, if you keep on reading, we get into the differences.